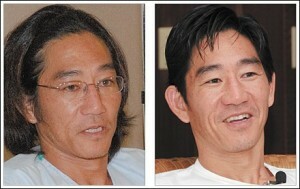 We covered the shark attack on Todd Murashige at Crouching Lion on Oahu earlier this year. The Honolulu Advertiser published this follow-up story to those events. Todd Murashige will have to live with the vicious scars from an attack that ripped his thigh open to the bone — and with the feelings he has for the shark that bit him. After two months of recovery and rehabilitation, Murashige is now grateful to the shark that changed his life. Murashige, 40, has not been able to work as a self-employed tile setter since he was attacked while sitting on his 5-foot-9 Kerry Tokoro custom board at his favorite surf spot, Crouching Lion. So no income has come from his side to keep up with the rent and other expenses for a family with two young children. He originally hoped that the medical plan for his wife, Heather, a teacher at Salt Lake Elementary School, would cover all of his operations and medical expenses. But Todd and Heather now find themselves with several thousand dollars worth of medical bills — mostly physicians’ services — that Heather’s HMSA plan won’t pay, she said. So they’re rapidly running out of the money they had been saving to buy a home of their own. At the same time, they’re also humbled — and embarrassed — that friends and family are organizing a fundraiser for them at The Willows restaurant on Dec. 3. But all of their money problems are second to the remarkable change that Heather has seen in her husband. Whenever the waves were kicking, Todd would stay out surfing long after the sun went down and wouldn’t come home until after 8 p.m., when the kids had already eaten and were getting ready for bed. He was a championship amateur surfer, with bookcases full of trophies to prove it, whose prayers were mostly for clean waves and, perhaps, another victory. “‘Send me the right waves, put me in the right spot,'” Todd would say before a meet. His smile caught Heather’s attention at Eastside Grill in March 1996, while she was a student at the University of Hawai’i. They had a couple of children — Tyler’s now 10 and Tiffany’s 8 — got married in 2001 and had their share of marital tensions. Surfing buddies such as Jason Mijo were happy to help organize a fundraiser for the Murashiges — and so were businesses and others who are making small and large donations, such as new surfboards and a two-night stay at the Halekulani. As the planning wore on, Mijo saw big changes in Todd. Change did not come immediately. At his only press conference after the attack, Murashige wore long, straight hair that hung over his glasses and often hid his face when reporters asked him how he felt. When Todd finally got home after four days at The Queen’s Medical Center, his attitude was the same, maybe even worse. On Todd’s second or third day home, Heather was washing his long hair when she finally had enough. They both swear they can’t remember what they were fighting about, but they clearly remember Heather grabbing Todd’s wet hair and getting his attention. Todd can’t quite explain it, but something changed inside him. The next day, they went to Fantastic Sam’s at Windward Mall and Todd limped out with a stylish and polished haircut — and a whole new attitude toward his wife, kids and life. “When the hair came off, everything else that was ugly and not a part of him anymore also came off,” Heather said. Todd now waits for his kids to get home from school each day, just so he can be around them. Todd knows that he can never get rid of the scars that remain from the single bite from what he believes was a 10- to 12-foot tiger shark. The attack left him with one set of bite marks ringing his right ankle and another set nearly circumnavigating the entire upper thigh of the 5-foot-4, 115-pound Murashige. By re-creating the bent position of his right leg while sitting on his board, Murashige compared the sets of scars — and estimated that the shark’s bite stretched about 18 inches across. He’ll always have to face the scars, but appears ambivalent about what to do with the damaged board he rode to win so many championships. The new Todd knows that Heather wants to keep it as a reminder of the day that changed his life. And after thinking about it for a moment, Heather yesterday said she realized that Todd really wants to discard the last remainder of the old Todd. Now, Murashige is excited about the rest of his life. He looks forward to some day soon going back to work and returning to the waves — although probably not in the same championship form. “People who love the ocean know the ocean brings a different type of energy, a different type of cleansing,” Murashige said. And now Todd Murashige knows that his time is now.